This is a post about food. You probably won’t care about this – I suppose I could preface any of my posts with that – but I imagine you care about food. I have traveled a good deal in my life, and I have been lucky to eat a lot of interesting things. Some of them I have sought out, others have just happened. Here are some of my favorite food memories. I hope you’ve eaten already. A few years ago I went down to New Orleans for a week. I ate crawfish,* which are freshwater crustaceans that resemble small lobsters. 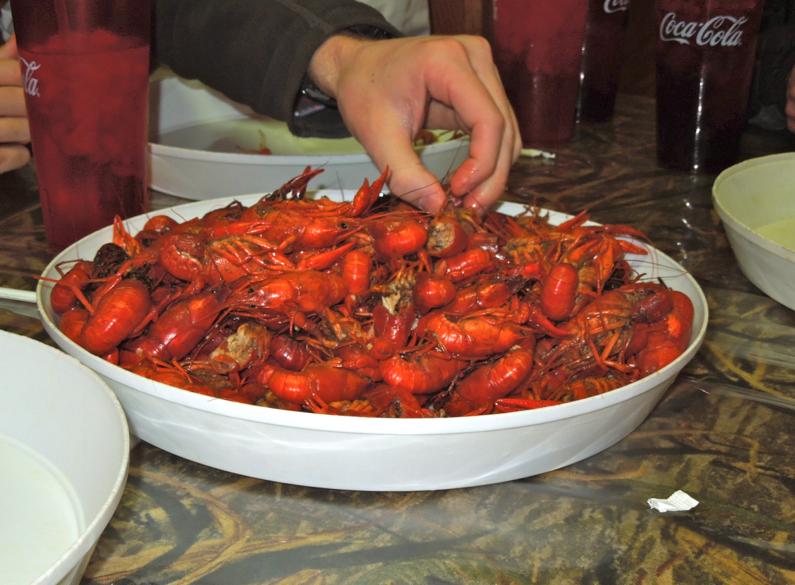 Louisiana supplies about 95% of the crawfish harvested in the US, which is why they serve them by the ton. *Some people call them crawdads. I think I like crawdads better. 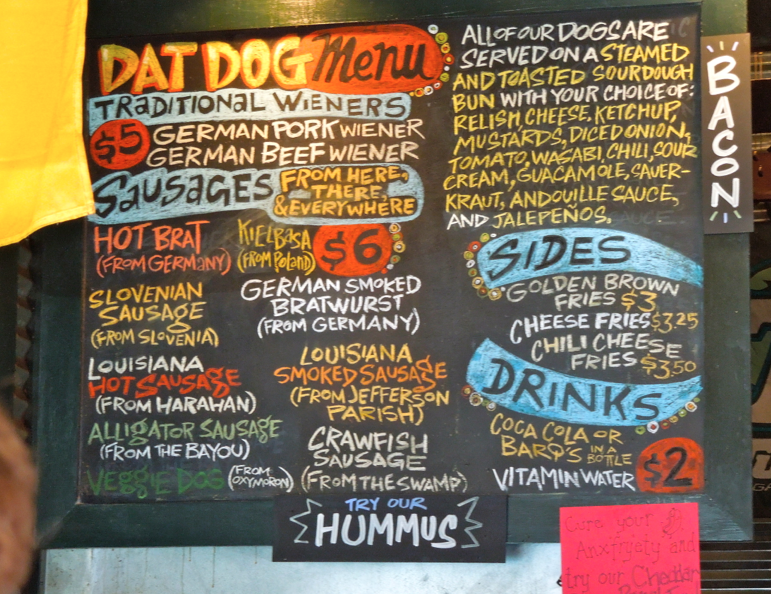 There were also gator dogs. I have a difficult time finding a good gator dog in the Northeast. In Normandy I ate muscles, moules marinières, or as I said when I ordered them, mouylees marinyerereydakjhaf. They were served in a cauldron. There was deep dish pizza in Chicago. It was fine, but I don’t see how anyone could think that Chicago-style pizza is better than New York pizza. Seriously, people think that. We ate at Lou Malnati’s, and according to their website, they have the best pizza in Chicago. Dear God, I hope not. I realize that every place in America claims to have the best pizza or coffee or burger or ribs, but normally this is, uh, not true. Everyone seems to think that their hometown has the best something. It is a point of pride. I am certain that the best chicken fingers in the world are at the Westchester Diner. I am reminded of the New Yorker’s Calvin Trillin when he was asked to describe his favorite burger. Yes, but don’t you see that one of those places actually IS the best hamburger place in the world? Somebody has to be telling the truth and it happens to be me. So, yes, The Diner has the best chicken fingers. And if you think otherwise, then I would like to engage in a civilized debate with you, even though you are wrong. A few summers ago, my friend Dan and I talked about going to all of the famous pizza joints in New York City, which at last count stood at 473859. We went to about three and then stopped because it is important to not spend all of your money on pizza and train tickets. There’s John’s on Bleecker Street, where I ate six slices, my all time record. A few months after that, the place shut down due to food contamination, mice, and filth flies. It has since re-opened, and I’ve been back once. I did notice the pizza had a little less crunch to it. There’s Lombardi’s in Nolita. Heavy on the sauce, light on the cheese, and I always seem to burn the roof of my mouth there. It is usually worth it. According to Wikipedia, Lombardi’s opened in 1905, and it has been acknowledged by the Pizza Hall of Fame as the first pizzeria in the United States. This, of course, begs the question: there is a Pizza Hall of Fame?? How about that. I would like to visit there one day. There’s Grimaldi’s, there are actually a few of them in New York City, but I have only been to the one near 21st Street. It might be my favorite of the bunch. The NYC pizza is always good, it’s an institution down there, but I would also like to recognize Paradise Pizza in Verplanck, New York, and Harry’s Pizza in West Hartford, Connecticut. I think they might be the best of all. Of course there are the great deli’s – Carnegie Deli on 7th Avenue, where we somehow got a private room to ourselves. There’s Rein’s Deli in Vernon, Connecticut, where we always stop on trips to and from Boston, even if it’s inconvenient or we’ve already eaten. There’s Zaftig’s in Coolidge Corner, which makes a great pastrami sandwich. There’s the Montrose Deli, which was our after school spot in high school and makes the best chicken cutlet BLT known to man. And then there is the bread list. I’m not particularly proud to admit this, but I suppose if you are still reading then you already know this or will withhold judgment, but I have a bread list. It is a life-long quest to find the best restaurant bread in America or maybe even the world. I haven’t decided yet whether to consider international submissions. Here is the top 5, which has changed sporadically throughout the years. 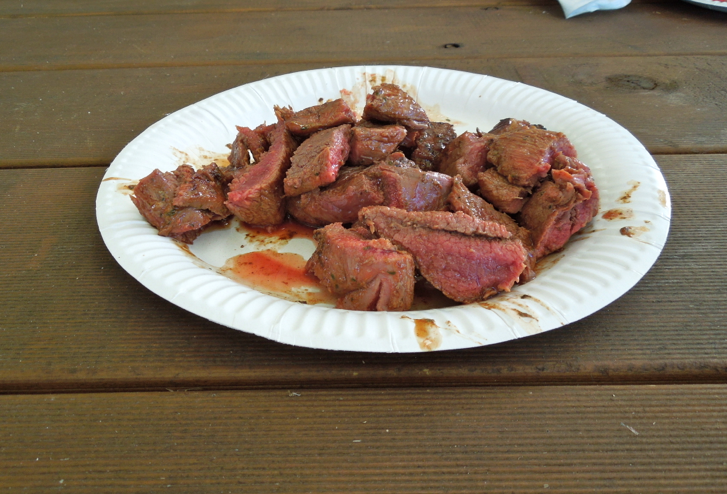 In Australia, we ate kangaroo. It has the texture of filet mignon, but it needs to be marinated well to have any flavor. Kangaroo burgers were also popular. 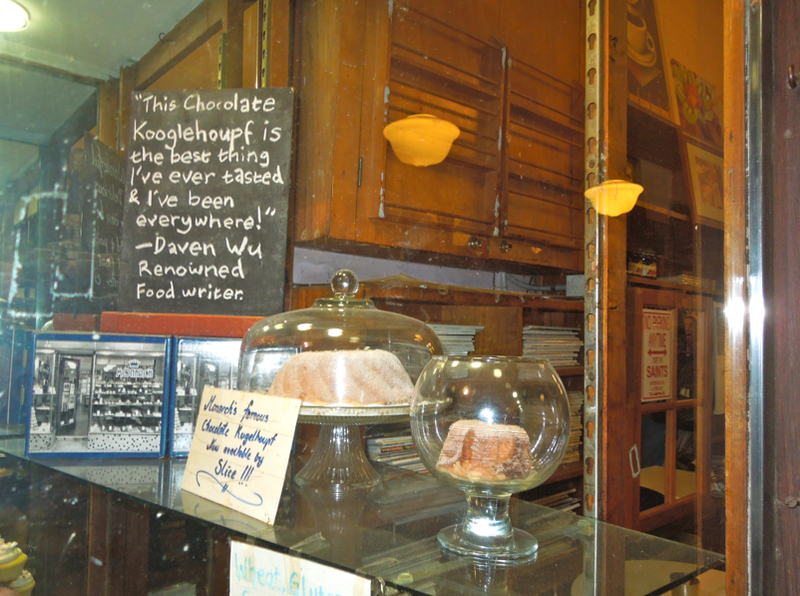 In Melbourne, I ate chocolate kooglehoupf. I didn’t know that was a thing until I passed this sign. Well, my first thought was Who the heck is Daven Wu? My second thought was that I had to see for myself if it was really the best thing I would ever taste. And, yeah, it was good. Really good. It was like a chocolate cannoli. But the best ever? No. Sorry, Daven Wu. There are the classic stadium concessions – Fenway Franks and Dodger dogs and Target Field’s pork chop on a stick and the ridiculously overpriced garlic fries at Yankee Stadium. I’ll always remember my first Shake Shack experience at Citi Field, where I waited in line for 30 minutes and then ate the burger in three seconds. Shake Shack burgers have had diminishing returns ever since. And then there are fictional foods. Dharma beer in LOST, Freddy’s Ribs in House of Cards, Walter’s licorice sticks in Fringe, Slurm in Futurama, Butterbeer in Harry Potter. Some years back, I read John Grisham’s The Last Juror, which contained this amazing paragraph that still makes me hungry. The first contained a pile of pork chops smothered in a sauce that included, among many ingredients, onions and peppers. More steam hit my face and I wanted to eat with my fingers. In the second there was a mound of yellow corn, sprinkled with green peppers, still hot from the stove. There was boiled okra, which, she explained as she prepared to serve, she preferred over the fried variety because she worried about too much grease in her diet. She was taught to batter and fry everything, from tomatoes to pickeles, and she had come to realize that this was not altogether healthy. There were butter beans, likewise unbattered and unfried, but rather cooked with ham hocks and bacon. There was a platter of small red tomatoes covered with pepper and olive oil. She was one of the very few cooks in town who used olive oil, she said as she continued her narrative. I was hanging on every word as my large plate was being tended to. OK, so now you are probably wondering, what is my favorite food of all? * What is the best thing I have ever eaten? And, you know what, I couldn’t possibly answer that question. *You are probably not wondering this. But I will tell you a story. When I was in New Zealand, I went to a sheep farm with a group of about 30 people. This was at the tail end of our trip, and it was a fairly long drive to get there, and by the time we arrived I was starving. I wasn’t expecting to eat until after we visited the farm. 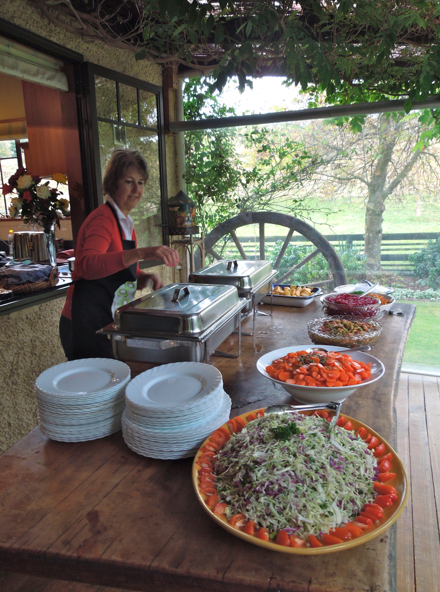 All of a sudden, a nice woman who worked at the farm brought out a massive a buffet of food. I mean, massive. It served all 30 of us. There were burgers and sausage and cornbread and potatoes and vegetables and then dessert on top of that. She had cooked everything herself. And, no, it wasn’t the best meal I’ve ever had. I’ve been hungrier. But I remember sitting there and thinking to myself that this was pretty good. It is not often in life that a stranger surprises you with a homecooked meal. It is important to recognize these moments. And so as the sheep bahh’ed in the background, and our trip wound to a close, I sat there with a most sincere sense of gratitude. I suppose food can do this.